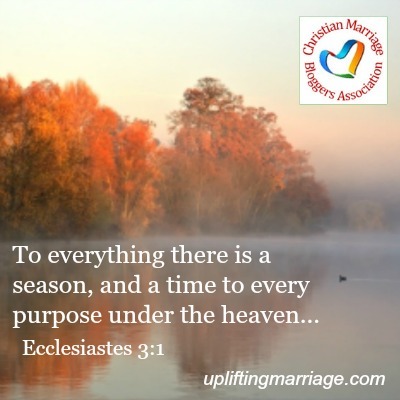 Just as we have seasons in life and in marriage, blogging has seasons, too. We lay groundwork for future growth. We re-evaluate our work and shift directions. We have times when we receive many comments, and then the comments taper off for a while. We add new sections and features even as we blend others together or allow some to fade away. We tweak our posting schedules. We update our blog design. No matter the season of blogging you are in, may God bless your work in encouraging Christians in their marriages. If you’d like to be able to see the most recent posts by CMBA bloggers, be sure to check the link in the CMBA Members Feed thread. Click here to join us. If you have questions about the CMBA Member’s Forum, contact Lori at lori@the-generous-wife.com. Please promote CMBA posts on your own social media. It’s a great way to support other bloggers and point your followers to some great material. Do you have an e-book, devotional, printable, or other resource that you’ve developed? Are you looking for other bloggers to review an upcoming book? If you have a resource that you’d like help promoting, send an email to Chris at chris@forgivenwife.com to have it included in a future newsletter. Congratulations to the winners of the August CMBA Blog Challenge: Marriage 4:29! If you’re like most bloggers, you’ve probably had times when you are stuck for a topic. You want to get a blog post written, but you have no idea what to write about. Try one of these ideas next time you find yourself stuck without a topic. 1. Search the internet for writing prompts. Check out these sites for ideas. BlogHer’s NaBloPoMo Writing Prompts – The idea behind NaBloPoMo (National Blog Posting Month) is that bloggers write a post every day during the month. Each month has a theme, and you can adjust many of them to fit the subject of marriage. You’ll find hundreds of ideas if you click around. WordPress.com’s Daily Prompts – With a different prompt for every day, some of these may stretch your creativity a bit. Have fun! Kludgy Mom’s Idea Bank: Your Source for Writing Prompts – Her post has over 600 ideas—and check out the comments for way, way more! 20 Prompts to Inspire Your Next Professional Blog Post at The Muse – These prompts are for professional blogging—but they could make great prompts if you relate them to married life instead of professional life. 30 Blog Writing Prompts That Don’t Tell You What to Write from Chicago Now – These prompts encourage you to be creative with formatting rather than giving you a subject. If you have a topic in mind but don’t know what to do with it, maybe one of these suggestions can get you moving. 500 Prompts for Narrative and Personal Writing, from the New York Times – This list is categorized to help you quickly find things that might appeal to you. How To Come up with Great Ideas for Blog Posts, Every Single Time – This article may help you head off future writer’s block by being proactive about collecting ideas. 3. Be inspired by your readers. Although you shouldn’t quote the email without the reader’s permission, reader emails can be a great source of ideas for blog post topics—especially if you’ve received multiple emails about the same thing. What advice do you have for people facing certain challenges in their marriages? How have you handled similar challenges? Be sure to take a look at reader comments on your older posts. You may find some great ideas in the comment section. While you’re there, be sure to look at your own replies to those comments. It’s possible that you have some brilliant insight just sitting there waiting to be made into a blog post. Do you have some new ideas that relate to one of your older posts? Write a new version of it, or write a follow-up. If you wrote about something you tried in your own marriage, give an update. If you’ve written several posts about the same topic, pull out the most important point from each of them and write a new post to reinforce those ideas. If you would like to be featured in one of our upcoming newsletters, contact Chris at chris@forgivenwife.com. We’ll provide you with some questions if you like. It’s a great chance to bring some fresh attention to your blog and let us know a little bit about you.